BRG manufactures digital timers for several applications, including surgery, sporting events, fitness, safety and countdowns to special events. Click on an image below to learn more. BRG Event Timers are perfect for counting down to the end of a special project, construction completion, graduation, a sporting event, retirement, etc... We offer several sizes, generic graphics or custom graphics for your special event. BRG's Fitness/Sports Timer is perfect fro track meets, marathons, fund raisers, auto racing qualifying and more. With large bright LEDs these timers can easily be placed outdoors on tripods. Heavy Duty water proof carrying cases are also available for storing and transporting the units safely. The BRG Safety and Accident Free safety timers are a great way to promote safety in the work place. 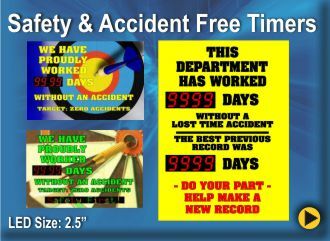 Place one of these at the time clock or break area to promote your safety record and keep safety in front of your employees. 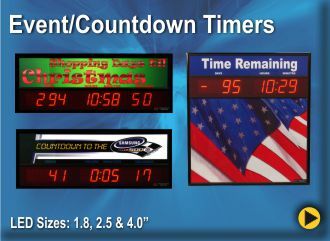 These timers are available with generic graphics or can be customized to show you message. 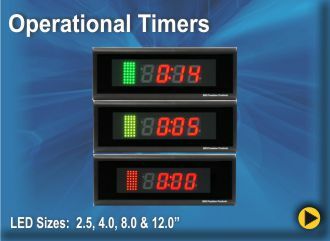 Operational Timers provide a visual reminder that time is running out with the Red, Yellow and Green LEDs at the left of the time. Simply set the event time, When you want to give a warning that time is running out and your ready to time your process. These timers can count up or count down. Below is a list of some of the different timers that we offer. Every timer operation is unique. We highly encourage you to contact our knowledgeable sales staff to discuss your specific requirement.